Scania today at Mobile World Congress launches Scania One, which provides a single digital environment to a host of connected services for fleet owners and drivers. With one-quarter million connected Scania vehicles, Scania One provides coherent and simple access to efficiency-enhancing services. Through Scania One, fleet owners and drivers will have access to the most relevant connected services that can simplify and improve their transport assignments. 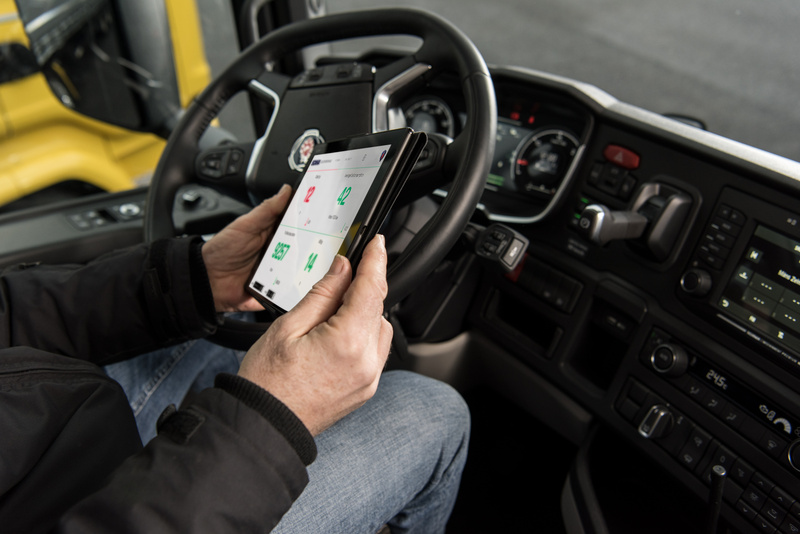 It constitutes an open customer platform for existing and coming Scania services as well as external content in the versatile Android tablet device. Scania One is based on communications technology-giant Ericsson’s software. It is designed to meet the varying needs of customers and drivers related to the trucking operation, transport assignment or simply personal preference. Since services may be added at will, Scania One offers an attractive single device choice. From the purpose-built tablet launcher, drivers can access all apps that the transport company subscribes to. Scania One features the Scania Fleet Management, the comprehensive monitoring and analytical system that provides fleet owners with an overview of equipment and drivers. It offers in-depth data on performance trends with regard to crucial factors that directly affect costs, such as fuel consumption and wear. It is also an invaluable tool in fleet planning, providing information on position and needed servicing. The condensed Fleet Performance app provides an abbreviated version of Scania Fleet Management with the most pertinent information. Check before drive – provides a digital checklist for guided daily inspections of brand-neutral vehicle and trailer status with time-saving opportunities to continuous record observations as the basis for service planning. Scania Assistance – allows drivers to digitally contact Scania’s assistance service and transmits position for speedy remedial roadside and workshop action. Guide me –guides drivers through an interactive tool with augmented reality functionality in acquainting themselves with basic functions. With the mobile device camera, dashboard symbols can be scanned to provide information in text or video. Scania will continuously add new features while also encouraging developers to add useful services, building a platform for optimised and efficient transport solutions. Scania One is compatible with the cloud-based platform of Volkswagen Truck & Bus, which also serves as the base for RIO, opening opportunities to offer additional services and a wider ecosystem.